In what seems to be unfolding as Donald Trump's lucky year, the Republican frontrunner got an extra boost today when former Alaska governor and "queen of the tea party" Sarah Palin announced her endorsement of his campaign. It all happened center stage at an Iowa State University rally on Tuesday, where the two stood beaming side by side as Palin rallied the Trump crowd with typical Palin-isms like, "[Trump's] going rogue left and right," and "Yes, the status quo has got to go." The new duo has got everyone making the wildest comparisons, even being called the "Trump-Palin political love affair" and sparking rumors that they'll be 2016 presidential running mates. The endorsement comes at an especially strategic time for Trump. With the crucial Iowa Caucus in just 13 days, the Trump-Palin pairing strikes a huge blow to Republican rival Ted Cruz, who Palin supported for Senate in 2012. The Cruz team may be "deeply disappointed" by Palin's public show of support of the mogul — but turns out, this isn't the first time Trump and Palin have been waving the same flag. Here are some other times America's most favorite polarizing characters have joined forces. Palin brought on Trump to her talk show, On Point with Sarah Palin, back in August, and the two couldn't have had more chemistry. Palin didn't hold back, giving us a taste of her admiration for Trump when she called him the "leader of the new world," and his presidential campaign avant-garde. The interview played out like a middle school romance, as Trump complimented right back highlighting Palin's great connection with the military, calling it "one of the reasons I've always liked you, Sarah." The two appeared to be a match made in heaven, agreeing on everything from topics such as the "screwed-up tax code," the need for libertarianism and the tea party, and the fact that Trump would keep "rollin' down the hill" of success in the polls. Palin wrote a colorful op-ed on conservative news site Breitbart in July to shame elites for criticizing a populist leader like Trump, calling the haters "silly kingmakers." Opening with, "The elites are shocked by Trump's dominance, but everyday Americans aren't," the long editorial pats Trump on the back for being an old-fashioned moneymaker and a great American entrepreneur with "the flair of a showman." If anything, Palin's vivid descriptions of Trump seem to paint an image of another lavish corporate billionaire rather than a conservative politician. But not to worry, Palin reassures, "There's nothing elitist about him." Trump was all sweet talk when he went on Mama Grizzly Radio, a talk show dedicated to "Sarah Palin news 24/7." The Republican candidate gushed about their similarities and the bond they share from both having haters on social media. "Now she has, like me, some people that don't exactly love us and we understand who they are and you sort of forget about that," Trump said on air. "[Palin] took so much nonsense, lies and disgusting lies, and she handles it so well." Trump didn't stop there — he even said he would love to consider appointing Palin to a member of his presidential cabinet. "She's really a special person and I think people know that," he explained. Sounds like Trump's got Mama Grizzly's back. 4. 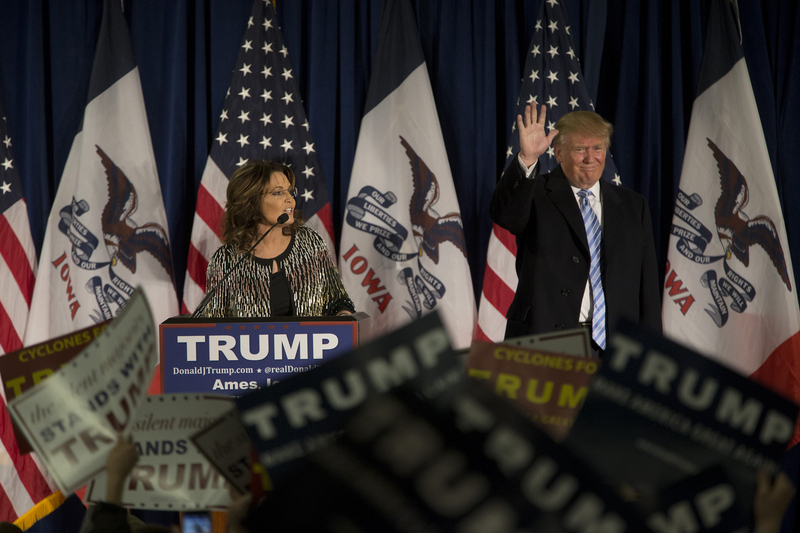 Finally... Palin And Trump On The Same Presidential Ticket? The former Alaska governor went on Saturday Night Live almost a year ago and participated in a question and answer with host Jerry Seinfeld. When Seinfeld suggests running for president, Palin simply answers: "OK, just hypothetically then, what if I were to choose Donald Trump as my running mate?" The statement may have been a joke — but then again, we're not really sure when Palin, infamous for her "I can see Russia from my house" interview, is being serious or not. With their past connections and today's endorsement in Iowa, it looks like the "Trump-Palin political love affair" will only keep growing. And in this whirlwind of a campaign season, there's no ruling out some crazy possibilities and unlikely pairings.